All information below is for historical reference purposes only. 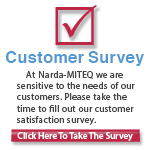 L3 Narda-MITEQ's TTA Series of high performance Broadband Low Noise Amplifiers were specifically developed for Electromagnetic [EMC] compliance testing. Our latest addition to the TTA series is our new battery operated version which allows for up 10 hours of continuous use on a single charge. This battery option can be purchased as a separate add on [TTABP] if you already own a TTA or supplied internal in a single enclosure at the time of the order as a TTAB. The TTA is enclosed in a small [5.1" L x 3.5" W x 1.9" H] case and the TTAB is in a slightly larger [6.5" L x 6.5" W x 2.0" H] case. 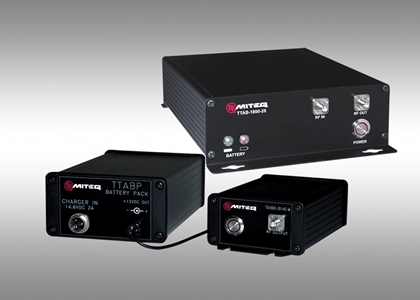 This series of amplifiers covers both the Commercial/Medical and Military bands for emissions testing and comes with our standard generous warranty. A universal wall plug in power supply is included with each TTA which operates from 50-60 Hz / 100-240 VAC. CE approved. The TTAB comes with a separate battery charger.